We know that it is very difficult to find a good quality JDM motor for a low price. We receive quote requests everyday from customers searching for a low mileage engine for their Honda, Toyota, Nissan and Integra cars. Finding a good engine on eBay happens every now and then, but you deserve to have a source where you can purchase cheap JDM motors for sale. Our Japanese engines are purchased only from reputable sources to cut out most of the problems that happen when buying used engines online. Need an engine for a new or late-model Civic? No problem. We have you covered with the largest Civic inventory to ever hit the Internet. It does not matter if you are an average driver, engine shop, mechanic or warranty service center. We sell directly to every person and give the same discounts. We keep every one of our customers happy because they keep us in the business of selling JDM motors. If you could never afford a Civic, buying an Integra is usually the next best option. We have Integra motors in stock and search the country and Japanese dealers to find first, second, third and fourth generation motors that drop right into your car. You do not have to settle for buying something at a junkyard or Internet auction that you cannot verify the quality. Our low mileage Acura JDM motors are awesome. It’s hard to deny that impact that Toyota has had on the compact car market. The huge sales numbers for the Corolla, Celica and Tercel have kept us selling used Toyota motors for nearly a decade. You already know the fuel economy, horsepower and longevity of Toyota motors. What you do not know is where to buy them cheap. We buy them at discounted prices and pass along the savings to you. It’s that simple! We are a name you can respect and trust to provide you with a high quality low mileage engine for your car. You don’t have to be a street racer to appreciate the power that is provided. Our engines are cleaned, doubled checked and tested for damage and shipped out to you fast. Call us at (866) 289-3100 and get your free quote. If you don’t want to call, fill out our quote form to get our low price by email. We make it easy, fast and very affordable to buy the JDM engines that you need. You will not regret buying our engines and you can stop buying engines on eBay or Craigslist that are not as described. Buying a JDM engine online takes some research on your part to make sure you do not end up with a rust bucket. This can be a challenge if a retailer is not honest with you when you are doing your research. We do not just sell used Japanese engines. We specialize in finding them, cleaning them and rebuilding them to give you a like new engine. 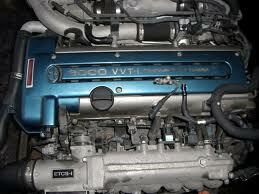 It is not true that all JDM engines have low mileage. Many dealers buy second and third party engines that are labeled as having low miles. Our selection process works as follows. Our engine experts make contact with our huge network of JDM engine dealers to find a particular group of engines. We negotiate and secure the best price to import these engines into the United States. After the used Japanese engines arrive, this is where the similarity to other dealers ceases. We immediately inspect each engine for quality using our engine checklist. If problems are detected, we go right to work addressing the problem before we put our name on these used Japanese engines. Names like Honda, Toyota, Mazda and Nissan mean something to car enthusiasts as well as us. We know the standards of quality put into building engines from these manufacturers and never cut corners during our own rebuild. Our goal is to provide you with the lowest mileage on all used Japanese engines that we sell. Every part that we install is an OEM or certified manufacturer part if an OEM component is unavailable. After our engine experts finish the rebuilding process, we move on to the testing and analysis phase before these used Japanese engines ever make it into our inventory. Our dyno testing will tell us if there are problems with the combustion, oil pressure, gas line or electrical wiring. We analyze the data to be sure that the horsepower is correct and that the torque is not compromised due to a hidden problem. After this series of tests, our engine experts OK our used Japanese engines for inclusion in our inventory. Get your instant price quote by completing our quote form. We do not ask for personal information. Speak with our engine experts at (866) 289-3100 to ask questions or to place your order for our used Japanese engines.